Turtle Island churns under the soles of my feet on this fair-weather day on the Gulf. The ocean is green near the shoreline—pea green. I’ve never seen that before. I wonder if an algal bloom is forming in warmer seas. A battalion of brown pelicans coasts on dark arched wings over the waves. Children build sand castles and bob in the surf while far out at sea large fishing vessels ply the waters for bigger catch. I can see one person atop a scaffold with a line trawling behind. I wonder about toppling into the cold, thick waves so far from shore. There are few shorebirds but it is late in the day. They are probably on the bay side of the island resting in warm dunes. A moveable feast of beauty and abundance, we call this Santa Rosa Island named to honor a young woman from Lima, Peru who lived 500 years ago. Take the story of Caretta caretta. She doesn’t even know we’ve tagged her with a dichotomous term to set her species apart from others. Her only inclination is to find a darkened shoreline and lay her burden down. Buoyed by the salty water she paddles with strong legs through the currents. Through heavy lid, she looks toward shore and vaguely remembers its smell and warm, gritty touch. Suddenly she recalls the hovering gulls with their piercing eyes and angular beaks. She quickens her advance in hopes she might outpace the probabilities. The moonlit shore is quiet as she takes purchase on the shifting sand below her. She looks from just under the water. Bright lights might turn her away to find a place where pale moonlight guides the way instead. It is instinctual. And should she come ashore and dodge the beach chairs and plastic bottles, to lay a hatch of eggs, and later when they emerge, so tiny and vulnerable, will her young head toward the sea with its shimmering moonlight, or will they head for the Holiday Inn instead? Countless volunteers tend turtle nests all along these Gulf shores to redirect hatchlings toward the ocean. Does it mean they are no longer self-sustaining? Caretta caretta, loggerhead turtle mom, come back! Come back! Will she find a place to lay her eggs? If she doesn’t, will she release them into the water and watch as a devouring host of predators gobbles them up as fast as they emerge? 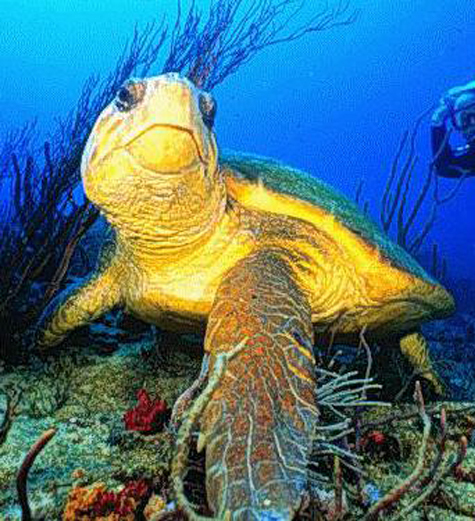 And, what of it…what if all the Caretta caretta’s disappear? Will it change my walk on the beach? To answer that question we would have to observe this beach over the long arc of time—not the brief period of a human lifetime. If we could go back even a thousand years (a bleep on the screen of geologic, Earth time) we’d see an abundance of birds, perhaps many we’ve never seen here before. And the waters would team with crustaceans; you could just scoop up dinner with your hands. We’d be looking at an ocean web of life that compares to today’s web like intricate lace to an old net. But if we do not know that, the old frayed net looks pretty good. A Yale psychologist gave this phenomenon a name: intergenerational, environmental amnesia. Basically, we’ve failed to remember our origins; we’ve forgotten to tell the human story. That story tells us how we evolved with a host of other species, interdependent on each other. In a far distant land, in a far different world, our kind began humbly dependent on the whole. We were part of something that worked, found its rhythms in a sort of give and take that leveled the playing field for all. Some little guys had the gift of a poisonous bite that made the big guys shy away and so on. Then we evolved an opposable thumb and a frontal cortex. We were powerful beings by virtue of our new intelligence. We learned to cooperate and bring down beasts that towered over us. We covered our bodies with their hides and set out to explore the world at large. We got caught up in our own ingenuity; we forgot our origins, intent on harnessing nature to our collective dreams. This was our infant sensibility. Today our task as a species is a difficult one: we need a dose of emotional honesty to accept that we aren’t as great as we’d thought. What’s superior about spoiling paradise, about circumscribing the futures of our children? Well, we can chalk it all up to immaturity, for our species’ evolution is new and our learning curve is a sharp one. We’ve got to use our talent for the good of all. We can’t repair nature’s living webs, but we can give her a chance to do it herself. For Caretta caretta we can turn down or turn off our lights, sit out on the decks of our homes and watch the waves glisten in the moonlight, listen to the oncoming waves. Is that so bad? Native American wisdom recognizes the Earth as Turtle Island, the continents forming plates on her back. In this era of human pervasiveness, we are changing the body of the Earth in which every living thing finds a source of life. For most of our species’ history we did not know that. But now we do recognize our impacts on the ecosystems that created the biosphere. Caretta caretta’s plight to find a darkened beach points us toward a path we could take. If we turn off our lights, she might find a place to lay her eggs, her hatchlings a way back to the ocean, and for us a reduction in energy consumption and carbon emissions. It is rare for us to make these connections. Small though they seem, it is myriad of these that need correcting. Global warming threatens our very existence. Since we are the cause of it, we can stop it. Doing so will correct our species’ relationship with so many others and begin to set things right again. Caretta caretta’s story is mirrored in the stories of countless species feeling our footprint. We must take up the cause for each of them where we live with the firm conviction that enhancement of life anywhere enhances life’s chance of survival everywhere. Identify a small area of land or a nearby river and defend its integrity with your life.